Many Turks believe having cold feet can cause an array of ailments. It is proven that outside shoes are a magnet for E. coli which most people associate with dirty rivers and lakes. Wearing outside shoes does drag harmful bacteria indoors, along with dog waste, urine, bird droppings to name a few. So popping on a pair of slippers does have its health benefits. Terlik are not just worn indoors but outside, at beaches, in the shower, pretty much anywhere feet can get wet or cold. This popular footware has an industry of over 470 dollars in Turkey with a 20% rise during summer months. There are many brands such as Ceyo, Twigy and Sevil with shops all over the country. Every outdoor market has an abundance of choice. There are regions that specialize in their own styles and museums showcase antique slippers from years before. Another popular version is the hand knitted 'Patak' slipper often made with love and given to friends and neighbours, these woolen slippers fit tightly and keep feet snug and warm. The terlik has played many different roles apart from being simply indoor footware. They used to be worn in Turkish bathing ceremonies, to depict status and importance. In Ottoman times the women wore high heeled slippers called ‘takunya’ and ‘Nalın’ these were important items and were worn during ceremonies, rituals and daily cleansing activities. The special slippers were crafted with carved wooden heels, made from ornamented wood such as walnut of sandalwood. The straps were leather or fabric decorated elaborately with precious stones, pearls, gilded thread and beautiful embroidery. The reason behind this lavish decoration was due to the fact these slippers were used as part of a womens dowry. The higher the heel, the higher the status in Ottoman culture. Another ancient tradition was that miniature versions of the terlik were given to new born babies as a gift. 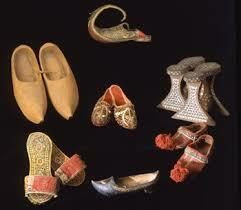 The genie style slipper with a pom pom on the toe is called a ‘Çarık’ popular in Ottoman times. The Turkish terlik has influenced world known designers such as Donna Karan and is a favourite with celebrities like Mick Jagger. The traditional water proof leather slipper called the ‘yemeni’ is made from three pieces of naturally tanned Turkish leather hand stitched. This style of terlik was used in the blockbuster films Lord of The Rings and Harry Potter with thousands being produced during the filming. The humble slipper has quite a rich history and influence in both Turkish in international culture.